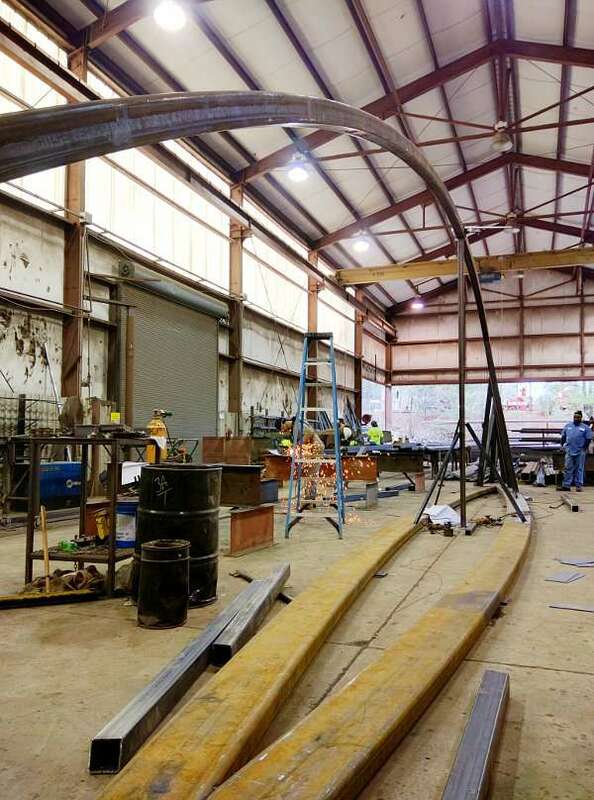 I got a call to come take my first look today at the beginning fabrication of a canopy structure I designed. It's always interesting when you see a project taking shape in the "real world" that had only existed until then in your mind, on paper and in virtual space. All along, this effort has been one of efficiency. 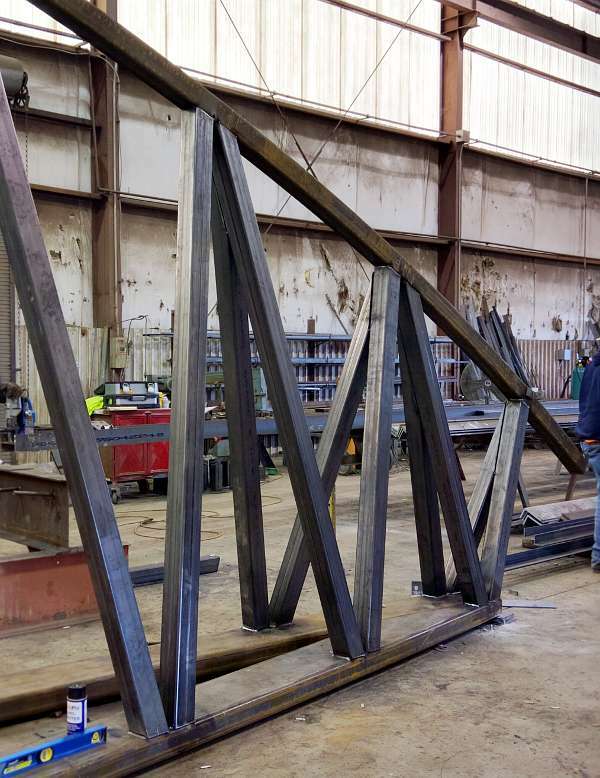 As the requirements and parameters grew, so too did the structure. This is fully 50' long and 25' wide but supported on only two columns. If you drive around to various gas stations, take a look at how they are supported. 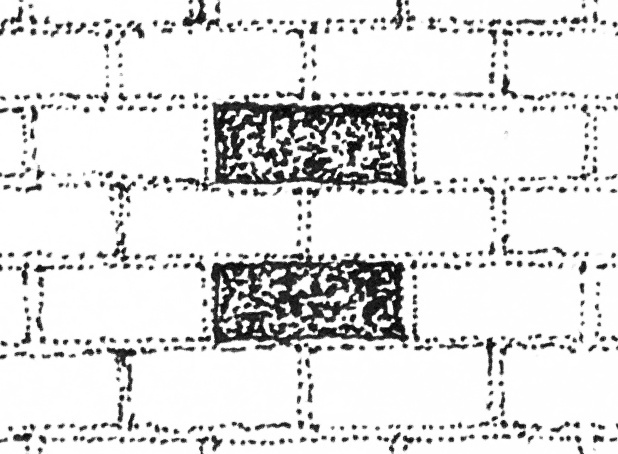 Almost all of them these days are constructed with at least four columns since the two-column variety are easily blown over. (And central North Carolina does occasionally get 90+ mph winds when a hurricane blows in.) However, site restrictions meant this one simply could not touch the ground at four locations. So the narrow profile and trimmed corners grew out of these restrictions and make this narrow, wing-shaped teardrop with very little resistance to the wind. For reference, below is my partial model of the project built months ago. I always appreciate great craftsmenship. With the design parameters vigorously dictating the form, it took some careful, considerate detailing to even make the structure feasible. Skilled craftsmen ensure cleaner construction and the necessary coordination when everything has to work and fit like clockwork. This entry was posted in 4D»2B, Better on 2015-12-18 by Steve Hall. 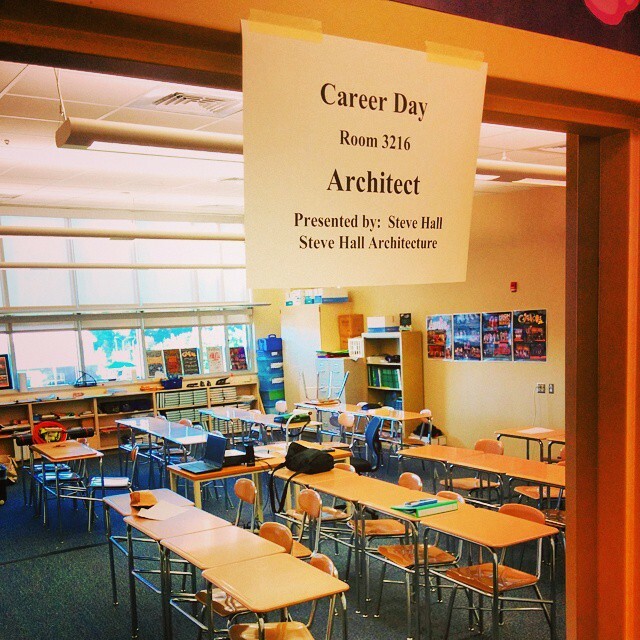 I was asked to speak to students at Mills Park Middle School in Cary a few weeks ago about a career as an architect. Whenever I speak about the profession, I try to show the larger view of what architecture really is because it in some ways, it is simpler than you’d think. Like many from my generation, thoughts of becoming an architect started early in life. Most of my friends in design school shared similar interests in drawing and making models. Today’s kids play Minecraft and many already know free design software packages readily available on the web like SketchUp. I don’t think they realize how close they are to the profession. I like to explain that art is where ideas form, but architecture is where they come together. Intuitively we know that impressive renderings of buildings in the news may not accurately represent the finished result. It’s true, the bridge from inspiration to completed building is as important as the initial “genius.” Fantasy images of ideas unable to be accomplished for technical, financial, or political reasons is a failure of the designer. However, the training to build this bridge is actually pretty simple and can start young. So what skills development of school children will translate into a successful architectural profession? 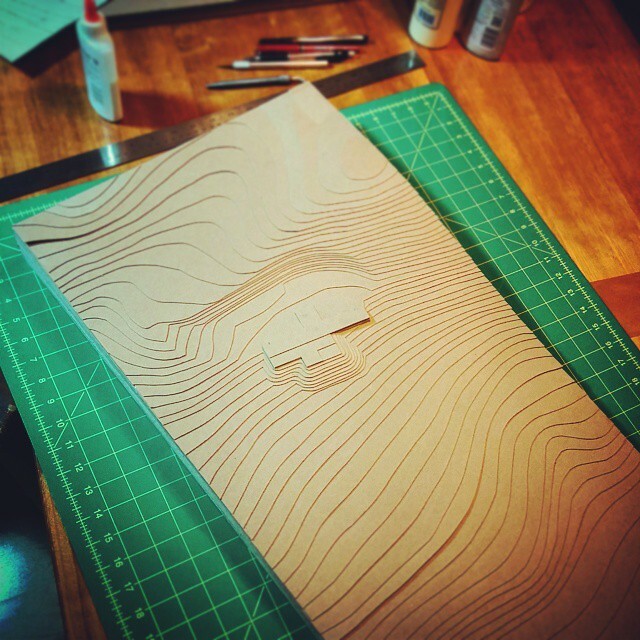 Site topography model of simple chipboard and white glue. For centuries, models have been used for design. A very high level of design thinking can proceed from simple paper and cardboard. Paper mache is about as basic and safe a medium as any for very young children to adults. 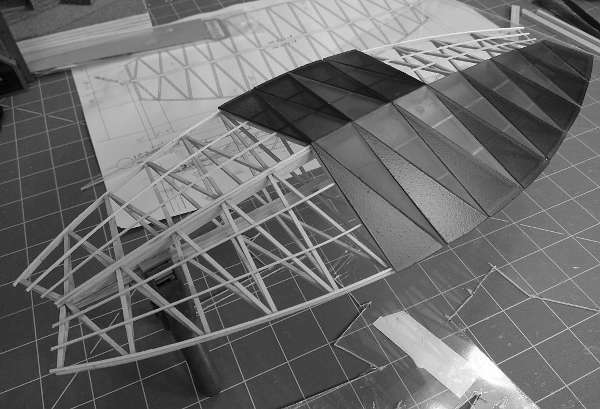 For the average middle schooler, a cutting matte, hobby knife, steel ruler with non-slip cork on one side, and some white glue are all that is needed to build sophisticated architectural models. In fact, even professionals frequently use them, as the photo above of one of my own models in progress testifies. Advanced techniques add basswood and plastics, all available from local hobby or art stores for very little expense. Today, architects sometimes build virtual models in the computer. These can be very realistic, such as my own example of the Reset House, still only a virtual project and physically un-built as of this date. When I was in middle school, my contractor neighbor suggested to me that architecture might not be a good career due to the rise of computers. This couldn’t have been farther from the truth. The exploration of physical materials and the meanings and beauty that results is critical to being a complete designer. Being able to express ideas with models directly constructed by hand is as useful and appreciated today as it ever has been. To the uninitiated, this may seem short of the glamorous renderings in the news, but it is a more valuable skill and easy to do. Thoughts about teaching kids to be an architect? Share your ideas below, on Twitter or Instagram. This entry was posted in Better on 2014-11-25 by Steve Hall. It isn’t often we celebrate a World Cup final! As a lifelong soccer and architecture fan, today is a great opportunity for me to draw some interesting comparisons between the two. Coordination is difficult but effective – Helping a team work together takes considerable effort. The communication, logistics, planning, and information behind the scenes look invisible on the big day, but many years go in to a winning conclusion. Training takes years – Great soccer players begin when they can walk to maximize the 20 years following for training. Likewise, most architects have at least 10 years of training before they are licensed, but many of us have been hammering things together since grade school. Team effort is more potent than any one team member – It takes a strong group of players working together to produce a victory just as a strong project team produces a winning building. Although one star or starchitect may get the credit, pros know that the supporting roles make it possible. No weaknesses can exist for a truly successful project. Roles are diverse but necessary – Futbol has a manager, trainers, strikers, attacking and holding mids, a center “D,” flanking wings and backs, and goalkeepers. Design teams need architects, engineers, authorities, reviewers, interior designers, landscape architects, contractors, and subcontractors. In either case, if not all roles are strong or represented, the others have to pick up the slack! 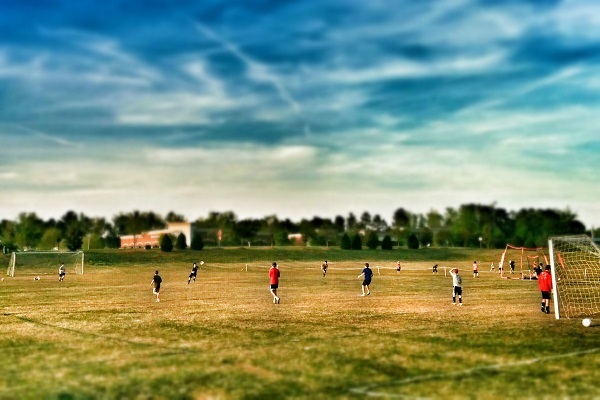 Expertise must be expansive – Kicking the ball is just the beginning of the game. It is knowing subtleties that carries teams to success. From looking off defenders and dropping a long through ball, to identifying potential site hazards on first walk through and noticing a non-conforming detail—seeing what’s missing is just as important as what is wrong. Planning for the site can’t be ignored – Understanding the impact of field or site conditions can be the difference between a win or a blowout. It’s a great place to start, and good design teams do a site analysis the same way a good manager plans for a potentially wet field that changes the speed and ball handling of the game. Effective tools make hard work productive – Players adopt all sorts of equipment to assist their playing styles, from shinguard height, cleat distribution, and boot cover texture. Although architects can potentially use all sorts of tools to assist, many, like an experienced pro player, rely on just a few effective ones to apply their seasoned experience. Big changes can happen in the middle – Good managers and architects are flexible when conditions and plans change due to injury or design change. In fact, spotting these possibilities early might just be the tactic that wins the game. Sometimes the outcome hinges on just one decision – Despite 90 minutes of play, a lone goal can win a game in a single instance of creativity or skill. Effective architects, like great strikers, are those that find a rare opportunity to turn a limitation into a winner! What did I miss? Please share below! You can also share your World Cup and Architecture ideas with me on Twitter or Instagram! This entry was posted in Better on 2014-07-13 by Steve Hall. 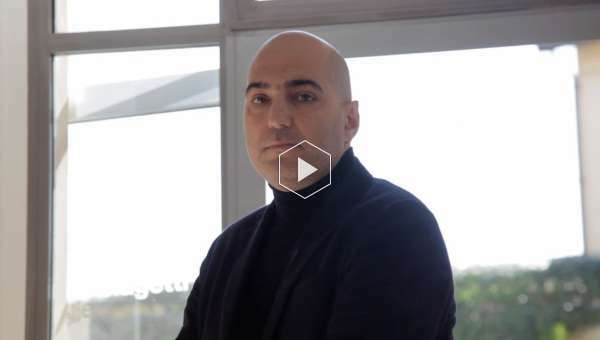 Every time I watch Alberto Biagetti’s home tour I want to convert my house into an art museum. Seven samples in, I’ve finally found the right white. Now all that’s left is the painting. And the paintings. This entry was posted in Better on 2014-03-12 by Steve Hall.